Glaucoma is a form of chronic optic neuropathy characterized by progressive thinning of the retinal nerve fiber layer (RNFL), narrowing of the neuroretinal rim, and deformation of the optic nerve head (ONH). Deciphering the temporal sequence of the structural changes of the RNFL, neuroretinal rim, and ONH and their associations with the decline in visual function and change in intraocular pressure (IOP) levels has major implications in the clinical management of glaucoma patients. 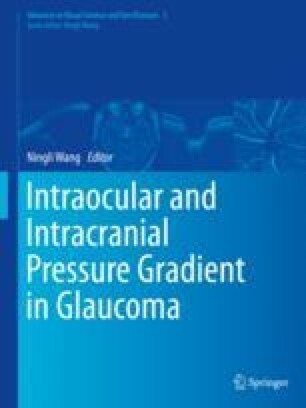 In a previous study following 90 glaucoma patients with confocal scanning laser ophthalmoscopy (CSLO) imaging of the ONH surface and optical coherence tomography (OCT) imaging of the RNFL at 4-month intervals over 4 years , we showed that among patients demonstrating both progressive RNFL thinning and posterior deformation of the ONH, 82.6% of eyes had posterior deformation of the ONH before progressive RNFL thinning, and the median lag time was approximately 16 months (Fig. 26.1). Whereas 7% of eyes had progressive RNFL thinning at the onset of posterior deformation of the ONH, about 46% had posterior deformation of the ONH at the onset of progressive RNFL thinning. This finding suggests posterior deformation of the ONH may occur before progressive RNFL thinning in many patients with glaucoma, and a therapeutic time window may exist upon detection of posterior deformation of the ONH before irreversible loss of the RNFL.